At the end of June, Portland, Ore. was dealt one of its most severe heatwaves in recent memory. And I got the flu during it. A mere week ago, we were dealt another STRONGER heatwave . . . and I got the flu again. That’s eerily coincidental. Luckily, I caught this one in time and doused myself with various forms of ‘Quil on the market. That and I offset the medicine head with copious amounts of apple cider vinegar and lemon juice. But of course, there was also the issue of what tea to drink. For most normal people that isn’t an issue, but tea still had to play an integral part somewhere. When knee-deep in flu-plague the recommended real tea is white tea. Straight-up young tea leaves and buds that are withered, dried and nothing else. They supposedly have antiviral properties, but – like the downy furs on the leaf buds – the science is a bit fuzzy on that claim. The problem with most white teas, though, is that they aren’t strong enough. Okay, not entirely true. 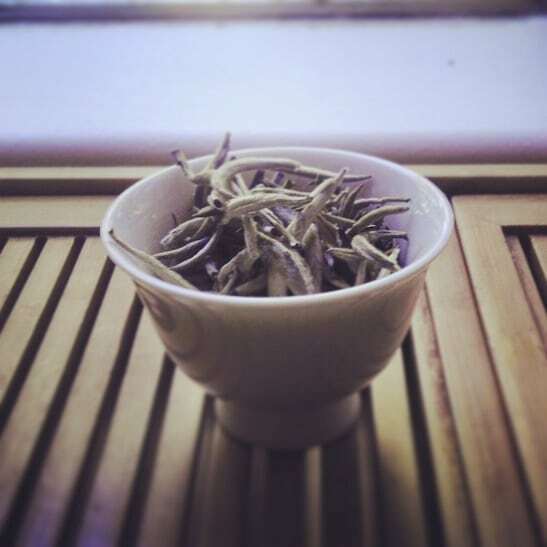 White tea leaves actually possess more caffeine than any other type because of their minimal processing. However, for most types to taste any good, they have to be brewed as light as possible. Boiled to death, yes, one would get the necessary daily-start caffeine wallop, but the brew itself would taste like a grassy turd. There are exceptions to this, but they’re hit or miss. My phlegmatic redemption lay in the form of two freakish teas from Norbu Tea I had in my repertoire that – as per usual – I had yet to get around to writing about. 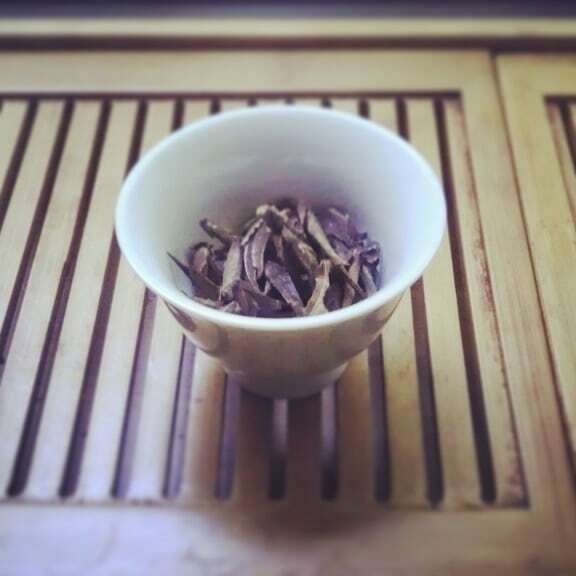 There were pu-erh teas out there that were made from young tea leaves and buds. 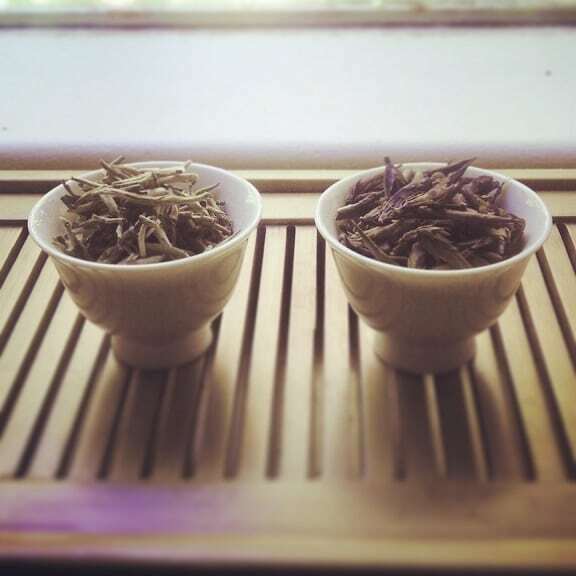 For all intents and purposes, they looked like white teas, but unlike their softer kin they went through a partial pan-frying – thus allowing the microflora in the leaves to change over time. In short, leaf buds that were meant to mature like wine. 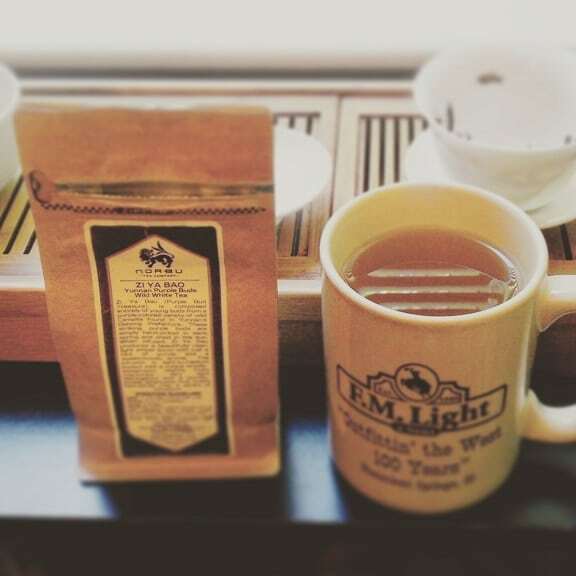 I featured a white pu-erh cake from Norbu Tea a year or so ago. It was amazing. This time around, I had one that was indistinguishable from a Yunnan Silver Needle, and another made from a wild-crafted, purple-hued cultivar. And I subsisted on both for a solid week. Right out of the starting gate, I was confused. The leaves for this looked like a straight-up Bai Hao Yin Zhen (Fujian Silver Needles)-inspired white tea. The leaves were needle-like buds with fur. They were even fuzzy to the touch. I couldn’t stop petting them. No, really. I was getting rather creepy about it, actually. The aroma also screamed, “white tea,” betraying a melon-‘n-grass scent that further perplexed my tea-trained nostrils. The fragrance was equal parts sweet, floral, and reminiscent of the scents one encounters while on a confusing hike at night. I . . . happen to like confusing hikes at night, and I’m easily lost. Moving on! I approached this gongfu style because, hell, if it’s going prance around like a pu-erh, it might as well drown like one. Brewed with short infusions, the liquor was pale yellow (like any old white tea) with a melon-like aroma. The true change – as warned – was in the taste. 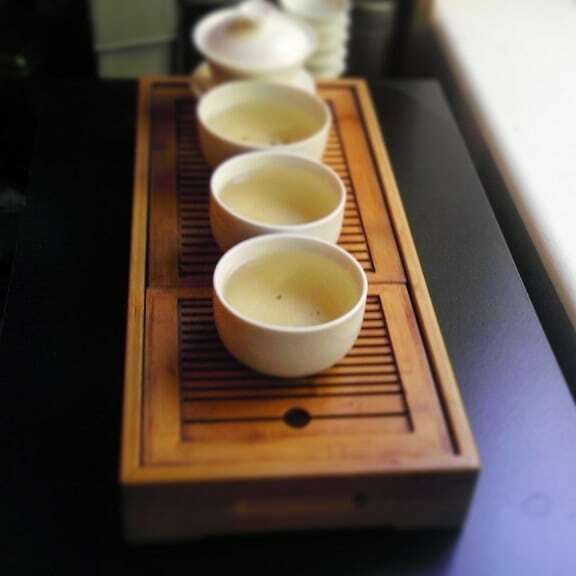 It was like a white tea on the forefront, which trap-doored into a sheng pu-erh palate. I felt like an unsuspecting gazelle pounced by a perplexed pu-erh cake. I imagined this tea wearing a white tea cologne, then stripping off its clothing to reveal its earthy wonder. And reveal, it did. The flavor reminded me of a few aged white tea cakes I’d test-driven. Then I brewed it Western style. The liquor was bold amber with a nose of straight . . . white tea. I couldn’t tell it a part from a Yunnan Moonlight white. On taste? Same difference. It was as if my palate gave me a proverbial “eff-you”, and left me to figure out what the hell I just drank. Yes, I liked it. Loved it, in point of fact. But I’ll be damned if I could identify it properly. 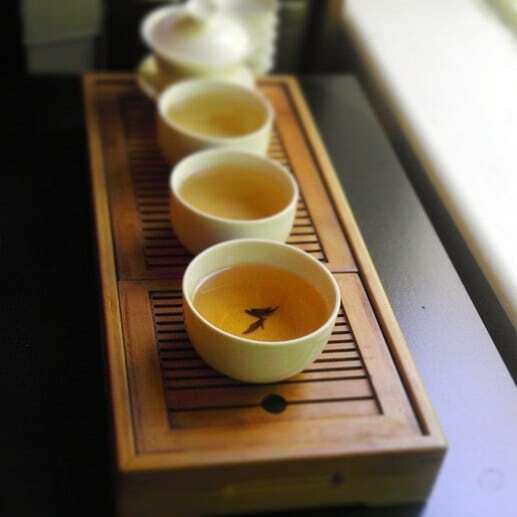 In short, if you actually want to identify it by its given process – as a pu-erh – you have to gongfu it . .. or your brain will melt at the palatial paradox. The wild purple buds of the Zi Ya Bao looked exactly like their name implied – purplish young leaves that hadn’t opened, yet. They looked similar to regular Ya Bao, save for the fact that the buds were thinner, possessed a typical tea leaf shape, and were actually of the tea plant species – Camellia sinensis. Their dry aroma was off-putting at first, very woody – reminiscent of wilderness weeds – but it grew on me. There was a sweet underpinning to its distinctly “wild” scent. After three successive, short infusions, a puzzling thing happened. Usually, when doing teas gongfu style, the infusions get incrementally darker. Not the case here. The first infusion was the darkest – revealing a bold but subtle amber palette, whereas further steeps proceeded to lighten in color. As if the tea blew its wad on the first go. Another interesting enigma was the taste. The first infusion was notably sage-like, similar to a Yunnan Moonlight white tea, but further (lighter) infusions were noticeably sweeter. The transition from sage to sweetness was lovely, and the change was organic, not jarring. (Unlike someone who eats only organic.) I would love to see this compressed as a cake and aged for ten years. A second attempt with new leaves brewed Western style, yielded a less complex brew. 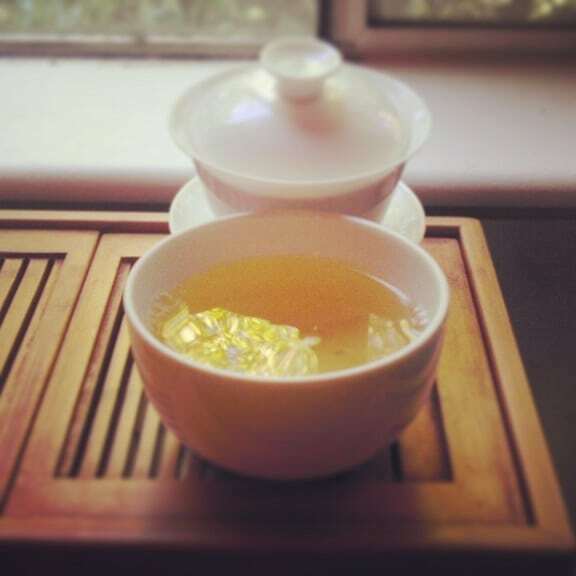 It turned out like a strong Yunnan white tea. Not a bad thing, though. Was there a favorite? Well, I actually found myself brewing more of the Zi Ya Bao over the course of the week. I mainly did the Yong De in the mid-to-late-afternoon. So, for functionality – and ability to put up with more punishment – the purple buds won out. For taste? The Yong De White Buds, by a mile. Did it help end my flu-plague? How the heck should I know? What do I look like, a snake oil salesman? They’re good teas, just trust in that. Every time is the right time for good tea. The flu during a heatwave sounds HORRIBLE!! As I was drinking my tea last night I couldn’t help but think how grateful I was for the lower temps. I just hope there isn’t another one before Fall shows up. Ya Bao is what I drink when I feel like crap. It never fails to lift me. I would’ve never figured you for a Ya Bao drinker. Two flus during two heat waves—what on earth did you do to deserve that? Oof. Maybe you are allergic to heatwaves? I know I am! Ha! I think you might be right. You look like an old snake tea salesman (just put whatever tea you like instead of snake). 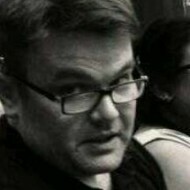 Yes, sigh, I do have that look about me.